WE ARE A COUPLE WITH TWO KIDS OF 15th AND 11st YEARS OLD. WE WOULD LIKE TO EXCHANGE ON JUNE, JULY, AUGUST OR SEPTEMBER IN 2016 OR COULD BE INTERESTING FOR US TO EXCHANGE ONE WEEK PERIOD TIME OUR HOME IN SANTIAGO DE COMPOSTELA OR OUR BEACH APARTAMENT IN SANXENXO (GALICIAN COAST). WE ARE LIVING VERY CLOSE TO THE HISTORICAL CITY OF SANTIAGO DE COMPOSTELA (GALICIA-SPAIN) AND THE WOONDERFULL GALICIAN BEACHES. 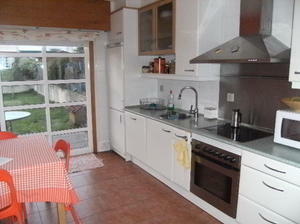 IF YOU WANT WE CAN EXCHANGE TOO OUR NICE AND CONFOTABLE FLAT IN THE TURISTIC VILLAGE OF SANXENXO IN THE GALICIAN COAST. THIS IS OUR SECOND LIVING HOUSE AND IT IS AVAILABLE DURING ALL YEAR. IT CAN BE INTERESTED FOR A RETIRED PEOPLE WHO WANT TO STAY LONG PERIODS IN SPAIN OR OTHER PEOPLE.